Spring is probably my most favourite season. I love the newness of everything. First peek of sunshine, crocuses poking out the ground, daffodils everywhere, and the start of a new year's vegetables, my favourite being broad beans. 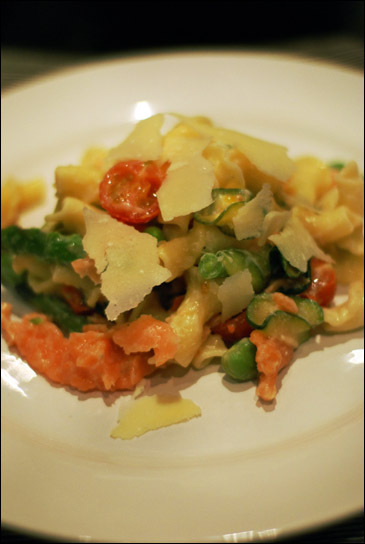 I decided to indulge a little by adding smoked salmon, but for a more straightforward primavera, without works just fine. First, put on a pan of lightly salted water to blanch your vegetables and bring to the boil. Top and tail your french beans and then slice into two, then break the woody stem off the asparagus - it should snap easily at the point where the woody part begins - and chop in half. Once the water is boiling, add the asparagus, french and broad beans and peas to the pan and blanch for 5-6 minutes. Drain and rinse in cold water so the vegetables keep their bright green colour, then set aside. Next, slice the courgette and the garlic. I used a mandolin for extra thin slices, but you can use a sharp knife too. Fry the courgette over a medium heat in a tablespoon of olive oil until they start to soften, then add the garlic. Cook for a further minute, until both are translucent then add the white wine. Simmer slowly, so the wine reduces by about half, then add the salt, pepper and crème fraîche. Transfer to a saucepan with the blanched asparagus, etc and stir in the parmesan. Put on a saucepan with a pinch of salt and bring to the boil for the pasta. Cook for about 10 minutes, as per the instructions on the pack. I also like making this dish with oricchette as it has a nice bite to it. When the pasta has a couple of minutes left, throw in the cherry tomatoes and give the sauce one final blast of heat. Drain the pasta then mix with the sauce in a large bowl. Stir in the smoked salmon and the shredded tarragon and mint leaves. Decorate with the pecorino shavings and serve.